An integral element of Bona Fide’s work is researching appropriate technologies for the area and demonstrating how they can be implemented. Infrastructure plays an integral role in human settlements and the ways we choose to utilize technology and architecture can be deciding factors in whether or not our communities are truly resilient and regenerative. By learning from others working throughout Central America and the world working in developing new techniques, and by examining traditional building in the semi-arid tropics around the world, Bona Fide has become an exposition of different vernacular architecture and appropriate technology for the island and similar climates. 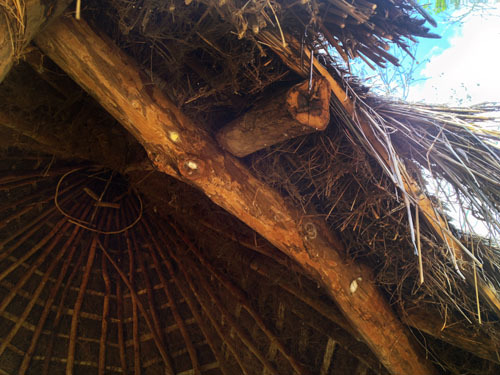 Many architectural patterns endemic to the island utilize local materials in distinct ways in order to create structures that cope better with hot sun, high winds, and heavy rain. 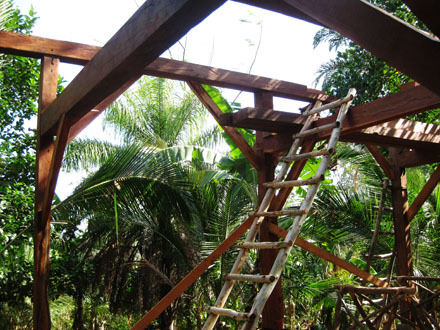 By exploring traditional designs, Bona Fide seeks to provide a set of models for natural and low impact structures built from locally available resources. Drawn from Nahuatl traditions, round post and beam structures held together with a compression ring and roofed with thatch provide shade and good ventilation to dissimilate heat, while the steep angle sheds water well. Foundations built from volcanic stone and finished with locally fashioned clay bricks provide a cool base of thermal mass. Despite their simplicity, these structures are some of the most comfortable on the property. Cob is a type of unfired clay masonry that involves a mix of clay, sand, straw, and manure into a concrete-like substance that can be used in a plethora of building applications. Its availability, low cost, good insulating properties, and malleability make it an ideal material for the tropics. Around the farm it is used both as mortar for dry stone constructions or for building on its own. We’re only just beginning to build with timber framing at Bona Fide, but are excited at it’s potential to create extremely long-lasting, durable and comfortable structures. Timber framing is a technique in which the wood used in construction is carefully chiseled so that posts and beams interlock and are joined by wood pegs. Not only does this eliminate the need for screws, nails, and bolts that must be fabricated in factories, but it also distributes the bearing of weight to the strongest parts of the structure. Utilizing wastewater from showers and sinks to its greatest potential is essential in a place where water is scarce for half the year. By imitating the natural patterns of rivers and tree limbs, a branch-drain Greywater system minimizes potential for clogs and evenly distributes water to a series of planted mulch basins with little to no maintenance necessary. We select species that will produce more, better, and out of season with irrigation in order to obtain a year round yield. In our kitchen sink system we have guanabana, citrus, Surinam cherry, banana and papaya, and in our western shower system we have coconuts and bananas. These two small locations will soon be some of the highest producing parts of our zone one. At times using non-local materials is worth it in order to get a more effective and longer lasting result, but when it is necessary we aim to minimize quantities and maximize efficacy. In terms of water storage, nothing compares to ferro-cement. Ferro, (from the Latin ferrous, or what would be steel) refers to an interwoven rebar support that is extremely strong due to an even distribution of pressure through a round form. The weaving is then coated in a thin layer of cement. The walls of a ferro tank are hardly 2 inches thick. Holding an equivalent amount of water in a square pure cement tank like the ones used locally would require more than a foot thick wall of cement, and is still be less structurally sound in the event of seismic activity. Bio-char seems to bend all the logic surrounding energy and waste. By super heating wood instead of burning it, a bio-char stove burns combustible organic gasses inside the wood, leaving only the carbon framework. 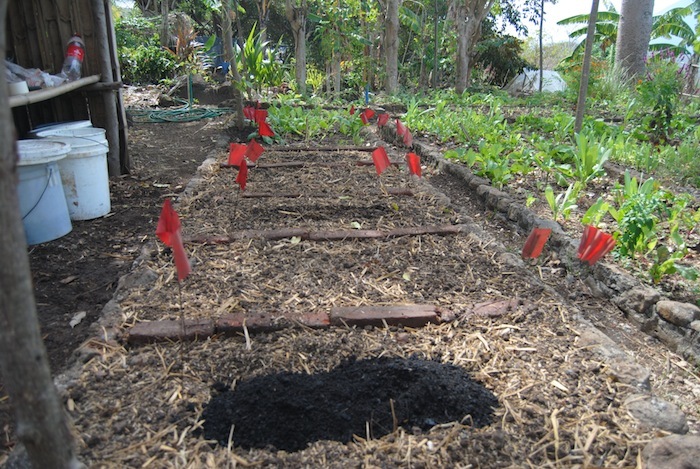 Bio-char, or activated charcoal, has innumerous applications. This charcoal shell possesses immense surface area and is ionized, meaning it not only is able to absorb large quantities of almost anything, but also keeps it there. This makes it an excellent soil amendment, capable of holding water and nutrients in the ground for long periods of time. Furthermore, by burying carbon as a soil amendment instead of burning it, the remaining carbon from the wood whose gasses are burned is removed from the carbon cycle, making bio-char stoves one of the only energy technologies on the planet that is actually carbon negative. Bona Fide tries to rely as little as possible on outside energy. All of our electricity is currently generated by solar panels, which take advantage of the strong tropical suns. A well-designed solar system is relatively inexpensive and easy to maintain, and is able to provide enough power to charge a heap of devices and give us some light and energy at night. 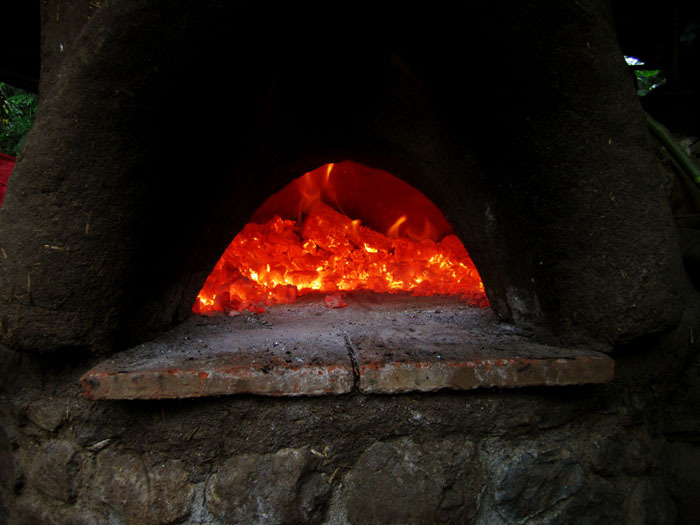 Large amounts of invested energy are intrinsic in the propane that fuels most of the stoves around Central America. Even apart from the gas itself, the tanks must be fabricated mechanically and then filled and moved numerous times before their use. We try to use wood fuel whenever possible. Many of the nitrogen fixing trees we regularly coppice to provide fertility double as sources of firewood. We cook a large percentage of our food on an open range, using a fuel-efficient rocket stove, and with our giant cob oven.